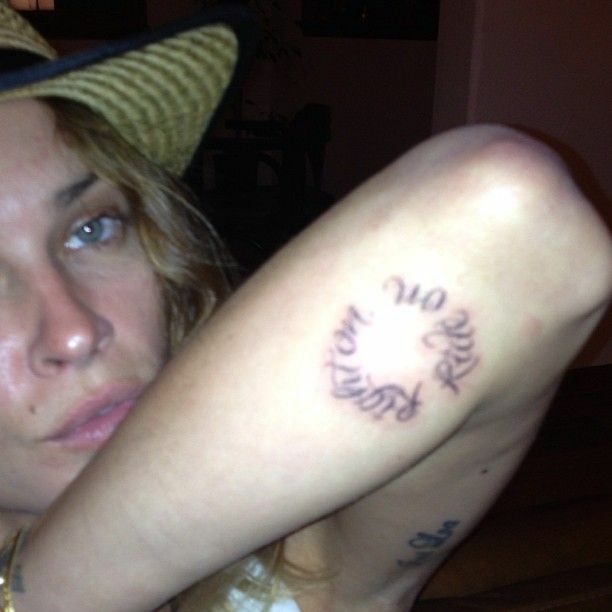 Erin Wasson is an American model, actress, occasional stylist, and jewelry designer. 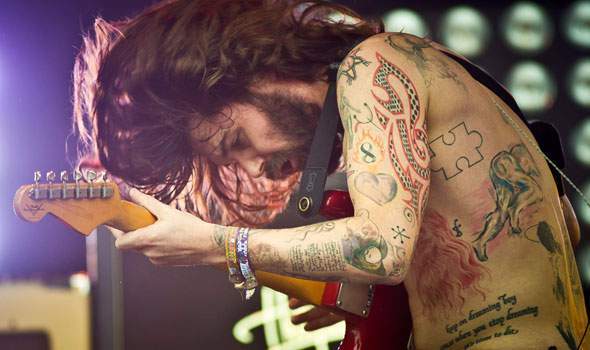 Wasson began getting tattoos at the ripe age of 17 and had a no-frills attitude toward getting inked. In an interview, she said, “I believe if you feel it, you should do it. Don’t overanalyze anything in life too much—you’ll make yourself crazy.” So, scroll down for her tattoos you want to copy them on your skin. 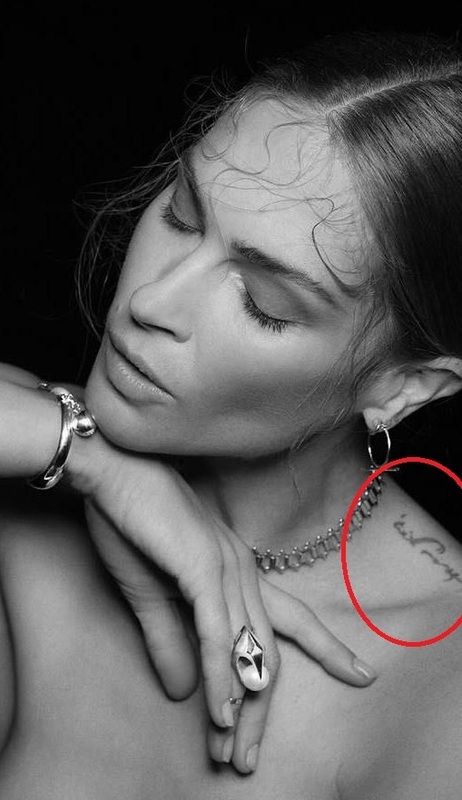 Meaning: Erin Wasson has word SHELTER on her back written in gothic font. This is the largest tattoo she has on her body. Tattoo: Erin has a pyramid or tribal looking triangular design inked on her Left wrist. Meaning: Erin has this undefined or somewhat blob shaped tattoo inked on her right wrist. This tattoo is blue shaded at its outline. Meaning: Erin has a phrase Right on, Ride on inked on her left forearm. The phrase is inked circularly. The celebrity Tattoo Artist, Dr. Woo had inked this tattoo in August 2013. Meaning: Erin has the phrase Babe is Busy inscribed on her right elbow. The phrase is written in bold letters. 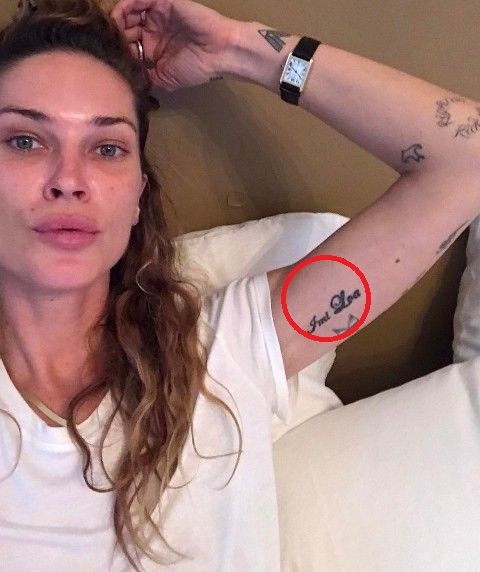 Meaning: Erin has Love, and Guts Tattoo inked on her Left Wrist. Meaning: Erin has inscribed the word Cream above her left breast. 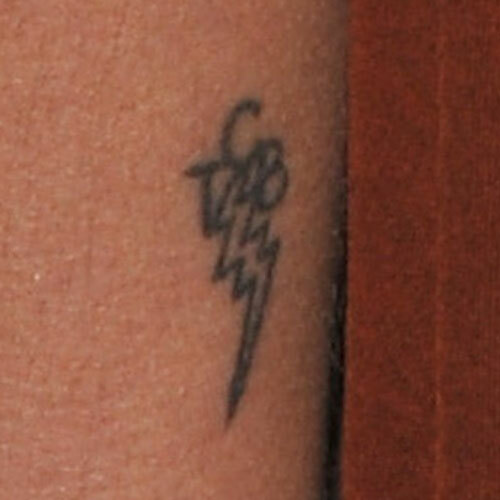 The tattoo is inked by Celebrity Tattoo artist, Dr. Woo, in fine cursive handwriting. Tattoo: Wasson has Eye inked on her little finger of her left hand. 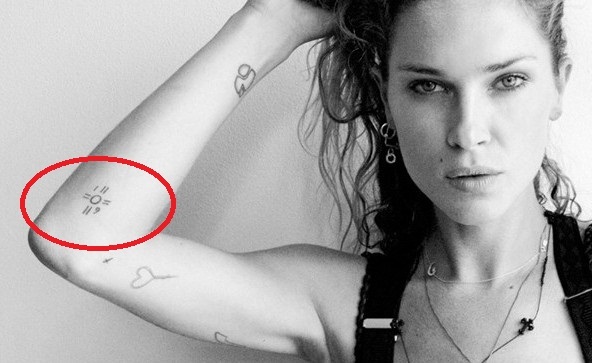 Meaning: Erin has inked a heart-shaped noose on her right elbow. The imagery and symbolism associated with a noose are almost never-ending, though two meanings stand out above all others; execution and death!! Although, Erin has never revealed the true meaning behind this tat. Meaning: Erin has writing inked on her left collar bone. It looks like an Arabic script on its first look. But the model has never revealed the true meaning behind this tattoo. Meaning: Erin has inked the word, Imi Loa on her Left Upper Arm. This is the Hawaiian word, which means, to ‘seek’ or ‘explore.‘ It is the word used for distant travelers. Meaning: Erin has an outline of a flying bird inked on her left forearm near the elbow. Meaning: Erin has the word love inked on her left wrist in bold letters. Later on, the word, Guts is also added into it, making it Love & Guts. Meaning: Erin has inked her left shoulder with the phrase ‘Keep it Neil’ on bold letters. She wrote, ‘Keep it Neil or Keep it real‘ on her Instagram post. Meaning: Erin has some undefined tattoo inked on her left lower leg. According to some other source, they are some numerals. But the exact meaning is still unknown. Meaning: Erin has some indistinct tattoo which is in leaf shape inked on her right wrist. Meaning: Erin has an outline of three circles inked on her Left earlobe. The three rings are in decreasing order of diameter from bottom to top of the ear. Tattoo: Erin has a little tattoo of a cross inked near her right elbow. 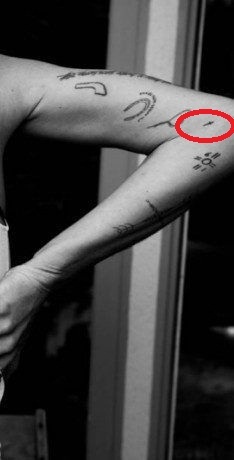 The tattoo is quite tiny. Meaning: Erin has a feather inked on her Right ribcage. The tattoo is shaded in black ink. Meaning: Erin has the phrase this heart will start a riot in me” inked on her right upper arm. The phrase is taken from the song, ‘That’s what you get’ by Paramore. 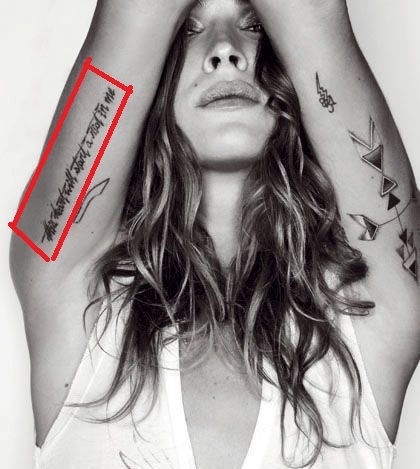 Meaning: Erin Wasson has American Native Design art tattoo inked on the back side of her left upper arm. The triangles in the tattoo are outlined with white ink which gives it a pure native look. Meaning: Erin has a tattoo inked on her right elbow. It has a small circle which is surrounded by four pairs of parallel lines, opposite to each other. It also has numerals ‘one’ and ‘six’ on the opposite sides. 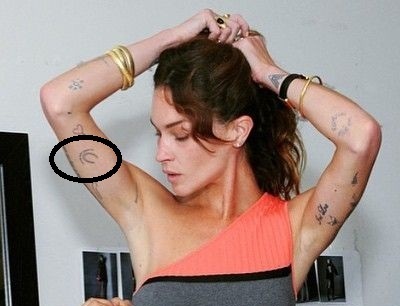 Meaning: Wasson has a horseshoe-shaped tattoo with writing below it inked on her inner side of the right upper arm. Meaning: Erin has an ill-formed design tattoed on her lower waist of the left side. The tattoo is circular, resembling the shape of an amoebic cell, with a snake-like face at its beginning.